Hello! It’s been a few days since my last post – life has been manic at the moment, and food wise, well, I’ve been eating the same old staples, so nothing new to report – until now. Well, until last Thursday. I met up with a very good friend in a restaurant that she suggested – Northbank restaurant, on the banks of the Thames – but had never been to herself. I had a look at the menus and lo and behold – virtually nothing for me to eat. So I emailed the restaurant, and a lovely woman called Elena responded and basically wrote ‘come on down, we’ll sort you out’. The views walking to the restaurant were stunning-good old end of summer weather. The restaurant itself was beautiful – Elena was there to greet us and took us to one of the booths – perfect for 2 people. The waitresses were absolutely wonderful, polite without being intrusive and thoughtful from start to end. I basically had a set menu with 1 option for each course. The starter was described as ‘mung bean salad’ and the mains were a ‘pea risotto’. Dessert – fruit salad with sorbet. The deal was 2 courses with a glass of prosecco for £22.50, not bad at all. 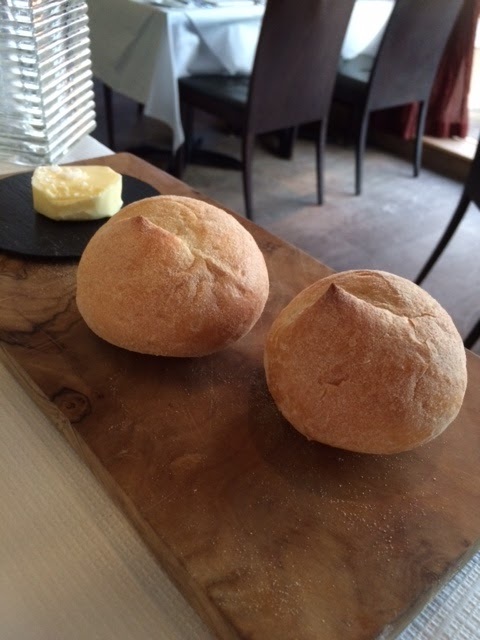 A couple of rolls of bread kicked off our dinner. They came with butter, and without me asking, they brought out a little jar of earthy, grassy olive oil for me. Warm crusty rolls dipped in olive oil. So far, so good. Before the starter, the chef sent out a little amuse bouche – the same one for both me and my omni friend. As soon as I had this little bite to eat, I knew I was going to have a good meal. This cupful had a combination of fennel shavings, pea shoots, carrot, orange and a touch of molasses. What a combination – I could have had this as a salad on its own. When my starter came out, once again, I was impressed. Expecting a few dodgy mung bean shoots, I got this beautiful salad. Oh My Word. Yes, the salad did have the shoots, but there were also three types of pickled radishes, rocket, pea shoots, and.. and… and… roasted, puffed rice. What a revelation. They added an almost smoky barbequed flavour to the dish. Each mouthful was different – lots of textures, lots of flavours and I enjoyed it down to the last mouthful. My mains arrived and it was a vision in shades of green. Plump, well cooked rice, wonderful pea flavour, whole peas, topped with deep fried kale leaves. It tasted like an old fashioned risotto, and boy, I savoured every mouthful. All in all, it was such a tasty meal, nice big portions, flavourful – I was very happy and didn’t even want to think about dessert (shock horror!) – this meal hit the spot for me. We walked to St Paul’s and the walk was just as lovely as the food. I do love London at night! All in all, another delicious meal, and with service like that, another reason to come back to Northbank Restaurant! I’m now going to tell you about my go to meal in London. This could possibly be the nicest dish I eat..and I plan to continue to do so for a long time. Oi Hanoi is a couple of minutes walk away from Aldgate East station, run by a wonderful Australian, Dave. I remember my first visit, looking at the menu, and seeing a good amount of veggie and vegan options. Vegan Pho! Vegan Summer Rolls! Vegan Curry! 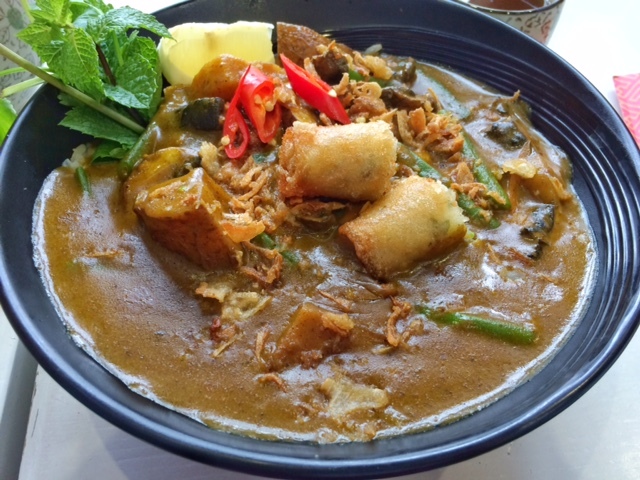 Love Asian food from all over – and it is usually dairy free!! I had the vegan curry, and that is when the love affair developed with the dish. It is the dish I always come back to. It is shockingly reasonable, and what you get is excellent amazing quality and value for money. Order at the counter, choose your seat and wait in anticipation. Oi Hanoi serves free tea with meals, although there is an option to buy some cool drinks too – almost all the Fentimans range and aloe drinks. But when I went last week, as usual, i always stick to the tea. It’s about the food baby! I decided to stick to the usual, having not had it for a few weeks, ordered the Ca Ri or the Oi Hanoi Curry – Chay, with organic tofu and veggies. And as usual, I asked for it with rice and to be extra saucy, oo er..
Each mouthful was different – textures, flavours, taste – but consistently delicious down to the last mouthful. So so recommend this place. I took 3 omnivores with me this time and for some reason, they also ordered this curry, and they thoroughly enjoyed it. It is definitely worth a visit!